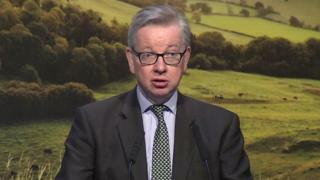 The government would support a special deal for EU farm workers after Brexit, Michael Gove has signalled. The environment secretary said the case for a seasonal agricultural workers scheme after the UK leaves the EU next year was "compelling." Agriculture needed access to foreign workers to remain productive and profitable, he told the National Farming Union's annual conference. NFU president Meurig Raymond said a "reliable workforce" was essential. The farming industry has called for clarity on the rules which will apply to EU migrants living and working in the UK after March 2019, and during a proposed "implementation period" up until the end of 2020. The UK has said those living in the UK for more than five years can apply for permanent residence, but the status of temporary and seasonal labour is less clear. Mr Gove acknowledged concerns that the number of EU workers coming to the UK for short-term employment picking fruit and harvesting crops was falling, partly - he said - due to the growing strength of EU economies. Contrary to what was often reported, he said many EU nationals working in British agriculture were highly skilled - such as the 90% of UK abattoir vets hailing from the continent - and would be difficult to replace. Continuing access to temporary and permanent labour, he said, had to be at the centre of a special "transition" deal for the industry, which has been guaranteed current levels of EU subsidies will continue until 2022. "Farming currently depends on access to labour abroad, both seasonal and more permanent," he said. "In future, we will need to look further afield than just the EU and we will need to think more creatively. But I also understand you need to action quickly, not least to deal with imminent pressures in the year ahead. "And the NFU has put forward strong and, in my view, compelling arguments for a seasonal agricultural workers scheme." Recognising the industry's "impatience" for reassurance, he said the government expected to announce more details about the scheme shortly. While farming had to become more capital and less labour-intensive in the long-term, he said immigration policy after Brexit must take into account the fact that many businesses were dependent on foreign, flexible labour. "We need that labour if we are to keep our farming sector productive and profitable." The UK operated a six-month seasonal agricultural workers scheme for decades until it was closed in 2013. Some Brexit supporters say this allowed UK farmers to become hooked on cheap, foreign labour, perpetuating low productivity and denying opportunities to British workers. The farming industry is worried about the impact of leaving the single market and customs union, given that the EU accounts for 60% of exports and 70% of imports. Several ministers have said Brexit could help lower food prices, by enabling the UK to reduce tariffs on imports from developing countries and do trade deals more geared to the UK's needs. But NFU president Meurig Raymond suggested there would be a price to be paid from pursuing a "cheap food policy". "Those who advocate... scouring the world for low-cost food should bear in mind the price paid in traceability, in standards and in the off-shoring of environmental impact," he said. "British farmers are extremely proud of the standards they adhere to. We mustn't let those standards slip and be undermined by a bad trade deal during Brexit negotiations. "Britain's farms need access to the EU market, we need access to a reliable workforce and we need measures to help our food and farming industry be more productive."